There are over five billion connected devices today, and 20 billion more are expected to go online within five years, Dell claimed. This opens the doors to new applications, new ways to simplify life and new business uses for the Internet of Things (IoT) market. "The IoT market will contribute to $50 trillion of GDP value. In the industrial world, a 1% increase in efficiency can lead to $1 to 2 billion in value," said Michael Raynor, Director at Deloitte, highlighting the importance of IoT in business and enterprise. Examples of this includes smarter cities and reducing costs, said Aneesh Chopra, the first Chief Technology Officer of the United States. "30% of healthcare expenses is wasted and is not valuable," Mr. Chopra elaborated, noting that we need a business model to incentivize doctors to keep patients out of the hospital. In the healthcare field, Joyce Mullen, Vice President and General Manager of OEM and IoT solutions at Dell, said that her company is working with developers to create smart pillboxes so that doctors will know when patients take their pills. Mr. Chopra adds that the connected healthcare model is not about the doctor's office and hospitals, but about the home because that's where people spend most of their time. According to Geoff McGrath of the McLaren Group, IoT is a design challenge and there needs to be machine learning to make sense of the data. Only 1% of the sensors collected are used in analytics, and you need very little data to have a large amount of impact, Mr. Raynor said. But, collecting all this data exposes you to more risks, like hacking, Paul Rogers countered in the panel. 70% of all industrial components were successfully hacked last year. This is something we don't hear about because of lack of regulations. Security professionals should be able to collaborate together to solve these breaches, Ms. Mullen said. The sharing of information would let us be stronger, but the framework for this needs to be institutionalize. We're not there, but the IoT revolution is bringing this to the forefront, Mr. Chopra said. Is there a way to get millennials to adopt wearables? "It's going to be able to figure out how to make the experience seamless and valuable," said Alexis Ohanian, CEO of Reddit. In terms of privacy, Mr. Ohanian says that privacy is extremely important to millennials. "We overshare because we opt in to it," Mr. Ohanian added. "We want to feel like we're in control." For wearables to take off, the devices have to be valuable, Ms. Mullen added. "It's not going to come from the health industry," Mr. McGrath said. "It's going to come from the fashion industry." For Mr. Chopra, wearables should help with preventative care and not just healthy fitness junkies. An example of this would be a smart vest that can detect heart attack risks. "It's for the millennials to put wearables on their parents," Ms. Mullen joked. 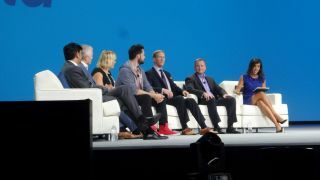 Another discussion is if IoT devices have to be online all the time, and although there were conflicting opinions from the panel, but the general consensus is that being connected needs to add value. For example, with parenting, a connected baby diaper may not make sense. You know when to change the diaper when your baby cries, Ms. Mullen said. An automated production line may not need to be connected to the internet, but it may be connected to an intranet to pull insights. Mr. Raynor said that a connected vest to detect heart attacks would be valuable, but a connected pacemaker would be disastrous as it could be hacked. For machines to learn, they have to be exposed, so security becomes an issue, said Mr. Raynor. The general consensus from the panel is that IoT devices can bring value and expedite processes, but security needs will need to be balanced. "You'll still need to keep humans in the loop," Mr. McGrath said. Mr. Chopra said it would take one device to get approved before you can get an industry going.